Throughout 2014, I read a vision care manual called “Vision rehabilitation: Multidisciplinary Care of the Patient Following Brain Injury “. It was an amazing experience. For people with binocular vision problems, or neurological vision issues more generally, the world can be very lonely and hostile as the vast majority of health care practicioners, including most ophthlamologists and neurologists, don’t really understand these conditions and don’t know how to connect the outwardly visible signs, anatomy and symptoms. Consequently they know even less about treating the root of these problems in a constructive manner and patients receive no care or care with adverse effects. Any remaining symptoms and functional problems left after these limited, superficial treatments would be ascribed to psychological factors or personal failing. A conclusion completely deattached from reality, causing a lot of grief and often halting the search for any meaningful solutions. It was this life experience and the accompanying feelings of isolation and frustration that made this book all the more wonderful to read. When this manual was first published in 2011, I was still having constant double vision and had discovered about proper vision rehabilitative treatment a year earlier through the internet and the book Fixing My Gaze. Since it was published recently, the book often refers to many of the recent and ongoing research surrounding neuroplasticity and visual neuroscience. I only discovered this elaborate publication a few years later after having read some of the more popular or accessible publications on strabismus and neurological vision conditions. The first major convenience about this book is that you can purchase it digitally which allows for audio-supported reading which I sorely need. I always emphasize the need of having digital/audio versions of vision books to the professionals that issue them whenever I get the chance to. I presume it’s not a need they themselves experience, or in some cases, not anymore. The most interested and voracious readers of neurological vision manuals are people with neurological vision conditions who, more often than not, have some level of reading difficulty. At many instances, I was so excited about what I was reading and how well-stated and well-understood it was by the authors that I could barely curb my enthusiasm. Finally, here was evidence of intelligent life forms somewhere in the world who meticulously describe and understand these vision conditions and symptoms I have been describing and battling against most of my life. I highlighted, quoted and copied many, many paragraphs due to their relevance and striking, perhaps almost stirring, agreement with my own thoughts and experiences. To me, this was not just a dull text book but a spot on description of many elements hindering my life along with detailed explanations of possible solutions to these hurdles. For my part, there was plently of limbic involvement that might usually be more associated with reading suspenseful and engaging chronicals. Exactly because I was so impressed and felt like coming home in a theoretical and clinical narrative that addressed my need for recognition and answers, I have wanted to write a book review that would reflect this wealth of information and insight. Nevertheless, as it often happens, setting overwhelming goals for oneself results in immobility and inaction. That is what happened during 2015. No book review had produced itself because it would not have been on par with the book itself and , ironically, not be in the interest of my own visual rehabilitation. In spite of my visual symptoms and low energy levels, I do want this book to be mentioned and written about. Instead of going over this extensive five hundred page text in minute detail and expressing elation at many of its passages, I will briefly go over its contents and comment a bit on what I remember of the respective chapters. 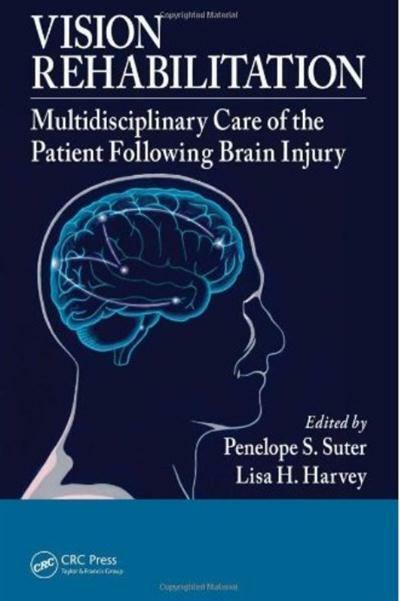 Bare in mind that this book might not be for the uninitiated and is written for professionals active or students aspiring to be active in the field of neurological vision rehabilitation. For it is composed with this target group in mind, the text includes much needed knowledge on technical topics such brain and vision anatomy, visual neurology case studies, clinical assessment tests, analysis of clinical data, vision therapy exercises, the application of spherical and prism lenses, etc. It also gives pointers on how to communicate your work and findings to other non-vision professionals and even within the legal context if need be. What is the usual setting in which vision rehab care has to be administered? 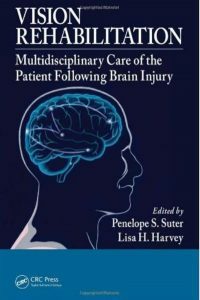 How can it be worked and interacted most effectively with other health care professionals who possibly perceive different priorities and might have other views when it comes to brain injury recovery? A very cool and thorough chapter looking at brain anatomy and what this assortment of structures and cells might do. The chapter begins by outlining basic terminology, general brain anatomy, brain development, anatomical divison of the visual system and then uses these building blocks to explain and hypothesize how these brain pathways, nuclei and cortical areas are functionally organized and interact to construct the experience that we call vision. The journey sets out examining subcortical, ‘reptilian’, areas and networks playing a vital role in maintaining critical functions, circadian rhythm, attention and receptivity leading us towards higher more advanced visual areas and the hypothesis of the ventral “What” stream and the dorsal “Where” or “How to” stream. This toolbox filled with anatomical insight allows us to look at visual disorders from anatomical perspective and helps a practitioner or patient to better understand what and where things might be going wrong. More than any theoretical psychological models, real physiology is often more revealing and helpful when it comes to figuring out treatment. Are afferent, efferent or both types of pathways damaged or interfered with? What is the weakest link in the structure and how can I address this bottle neck? After having established some theoretical anatomy knowledge, we move on to thinking about how this connects to the patient sitting in front of us. How might defects or developmental delays manifest themselves? What symptoms occur? How does it affect oculo-motor performance and visual perception? How does this affect spatial vision, functionality, balance, visual guidance of movement, subjective experience, sensory coherence and, more generally, quality of life? In many ways this has been my favourite chapter of the book. It’s a broad topic but the authors have managed to retain overview, structure and practical relevance. Even though there are regular references to anatomy and anatomical brain areas, the goal of this chapter is to see the forest for the trees. The different phases of the active seeing process are discussed. The different types and dysfunctions of eye movement, and how they are consequential for visual perception down stream, are described. The long-standing Skeffington model of seeing (where am I, where is it, what is it, what should I do or say about it), which dates back to the first half of the 20th century and has proven clinical usefulness ever since, is underpinned with more recent research such as the ventral “What” stream and dorsal “Where” stream as mentioned earlier. Nonetheless, it gets even more interesting when things “get real”. How to evaluate your patient for binocularity? What are the basic guidelines and key concepts for administering engaging Vision Rehabilitation Therapy? And last but not least, a long and detailed list of illustrative optometric vision therapy procedures, how to execute and evaluate them. This chapter too mentioned several familiar elements of my experience and went on to explain the why and how. Check out a more elaborate blog post on this chapter here. How does vision, the position of our eyes and the light rays providing them sensory input, influence our subjective perception of where we are and how does this in turn influence our interactions and performance? In strabismus this is very often a pronounced theme as the patient often only uses one eye or alternates between them, effectively shifting between two distinct egocentric localizations. How can therapy and in particular yoked prisms be used to normalize egocentric location to improve performance and interaction? This chapter gets into the specifics of how to use lenses for daily life or in therapy to, sometimes drastically, improve the functionality and quality of life. What are the optical qualities of spherical and prismatic lenses and the various materials they can be made of? What are the trade offs you need to be thinking about when prescribing them? What are the effects of the lenses on the neurology, physiology and kinestetic functioning? (It’s not what a lens does to a person but what a person does with a lens. – Kraskin 2002) How do prisms bend spatial vision and what are the pros and cons of this ? If done well, prescribing and fitting lenses (for people with binocular or neurological injury) is a surprisingly complex balancing exercise between many factors and constraints. Furthermore, it is important to consider the exact goal of your lens. Are you looking to stabilize the current visual situation or looking to guide someone to embolden a weak visual system over the long haul which might engender some transitional discomfort. Different tools for different purposes, as they say. After setting up this framework of questions and considerations, the reader is initiated in clinically applying this knowledge in evaluation and treatment procedures. I personally liked this glimpse behind the curtain of lens prescription. Photophobia, or sensitivity to light, is a very common problem for people with brain injury and/or strabismus. To some extent it is also a problem to me personally and I know some strabismics who have an even worse issues with light. The impact of photophobia on daily life and the theoretical causes are outlined very poignantly as well as possible treatment options such as light and color therapy and colored filters. Binocular problems are also fittingly pointed to as possible main cause of photophobia and, if that is the case, restoring binocularity should be the main focus in treating the photophobia. The connection between vision, balance and the vestibular system is immensely intricate. I have dealt with this topic, drawing on information from this book and chapter, in this blog entry. What’s the difference between the neuro-optometric and the occupational therapy approach to treating vision and motor dysfunction? A history, research overview and ways of complementing and collaborating with each other. What can we say about visual processing speed? Or the effects on memory, spatial maps and perceptual organization of impaired visual processing? How to evaluate minutely and what are the keys to successful therapy? Visual processing problems can both occur together with and without oculo-motor deficits. This chapter zones in on the practice of examinating patients with neurological disease and injury. You can let your neuro-nerd flag fly once more and enjoy the technicalities and neurological nomenclature needed to make useful observation and come to verifiable conclusions. How to make your vision rehab business commercially viable so you can keep providing care in a lasting way? This was one of the first chapters I read. It bore great pertinence to my personal situation. Frequently, when dealing with this patient population, something happened damaging the visual system entailing great efforts and costs on the patient’s part to recover, if at all possible. How can you protect your own or the patient’s interest in a legally corrrect way showing a direct link between the indicent and the diminished performance of the visual system and the person more generally? The incident might be a car accident or a work related mishap but can also be medical malpractice, such as inappropriate or poorly executed strabismus surgery. Anyhow, I don’t live in a country with a common law legal system and don’t have the means or energy to start a legal procedure. Furthermore, Doctors of Optometry (OD), as opposed to ophthalmologists (MDs), not have any legal or professional status in Belgium/Europe so they could not even act as expert witnesses if they wished to. If you live in a country that has those professional priviledges established for ODs, the chapter has very useful tips. Penelope S. Suter and Lisa H. Harvey have done a skilfull job editting this extensive document. Despites its many authors, the book is coherent and can be read as a whole. Yet, chapters also stand well on their own and can be read individually. When purchasing the Google Books version however, one must be aware that you will be deprived of the illustrations normally accompanying the book. They are omitted for fear of them being copied, I presume. This was a massive disappointment after paying 50EUR for the text. Another punishment for not being able to read regular print due to visual impairment. I think we can all see the irony in that. The illustrations and diagrams, once obtained, are nonetheless marvelous and an intricate part of the book. I have pinned many of them on my wall, serving as motivational posters. I recommend this book for students just starting out in the business, professionals who want to deepen their engagement towards Vision Rehabilitation and for visually impaired patients with some neurological and optometric initiation who feel misunderstood by their medical professionals. Vision Rehabilitation was produced by a band of brothers (and sisters) residing at the leading edge of their field and infuses you with some of their knowledge and insight. So excited to read this.